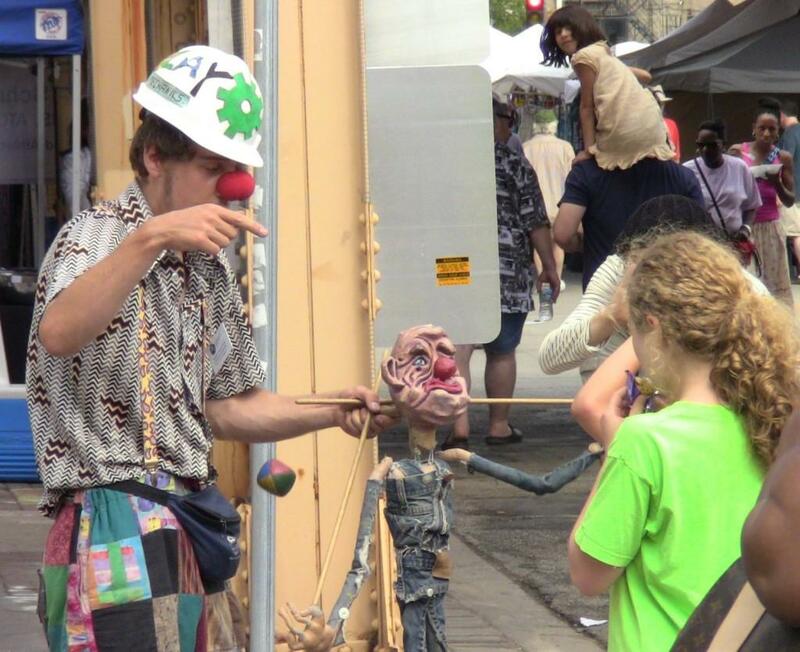 A street performer plays with a puppet Sunday at Custer's Last Stand, an annual arts festival near Main Street. The weekend fair got off to a slow start due to rain and strong winds Saturday. Custer’s Last Stand vendors battled strong gusts and protected their wares early Sunday morning in preparation for the last day of the 42nd annual arts festival. Police and fire officials warned the event’s organizer, the Piccolo Theatre, that adverse weather conditions could affect the fair’s electrical grid, said John Szostek, the director of the theater, 600 Main St. He sent four workers to set up booths blown over by wind shortly after midnight. About 150 vendors set up shop in randomly assigned locations for the two-day fair this weekend, said Cody Fox, a Custer’s Last Stand employee. Attendees strolled past booths lined up from Main Street to Madison Street, and bands performed on the Piccolo Theatre Music Stage. Restaurants, businesses and arts-and-crafts groups sold conventional and quirky products ranging from sunglasses to marshmallow-shooting guns. “We try to envelop locals with cultures from all over the country,” Fox said. Gary Londer, a vendor and regular fairgoer, said Saturday’s rain and wind dampened his business. The Buffalo Grove, Ill., resident compared his booth’s location to a wind tunnel and said his sales had not recuperated the fees he paid for space rental, parking and electricity. “I’ve seen it when it’s jam packed but … they put me in an area here that people don’t want to come back,” Londer said. The fair attracts more than 70,000 people and features hundreds of booths every year. It was created in 1972 to highlight the businesses on Custer Avenue and named in honor of Gen. George Armstrong Custer, who served in the Union Army in the Civil War. Piccolo Theatre partnered with the Chicago Danztheatre Ensemble, a dance and theater group that will receive some of the festival’s proceeds. Ensemble members also volunteered at the fair. “It was kind of a slow start, but when it cleared up, a lot of people came,” said Ellyzabeth Adler, director of the ensemble.